In the highest leverage game of their playoffs so far—don’t you hate the term “must-win” in non-elimination games?—Predators goalie Pekka Rinne turned in his best performance of the postseason yet, anchoring Nashville as they beat Winnipeg 2-1 on the road in Game 4 to tie their second-round series at two games apiece. 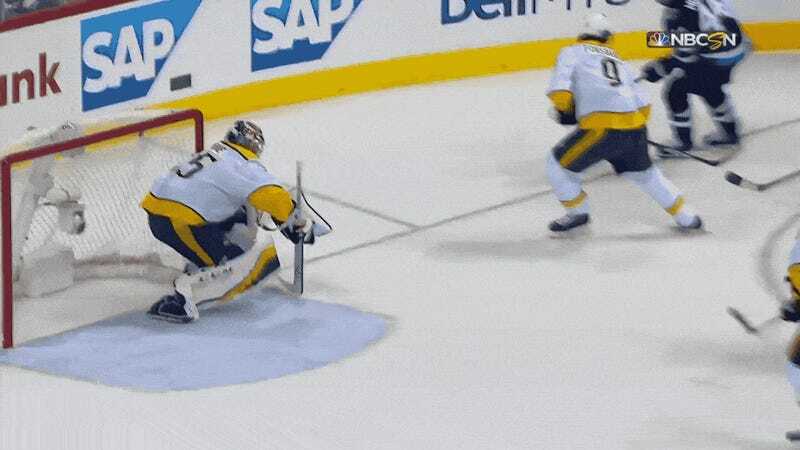 Aside from a Patrick Laine wrist shot that five-holed him with under a minute to go in the game, Rinne was perfect, making 32 saves on a night when Nashville needed every one of them. Following a Game 3 loss that saw him give up five to the Jets after being gifted a three-goal lead, and a decidedly average run of playoff games in which Nashville was much more reliant on their offense than the man in net, Rinne finally stepped up and delivered a first-star performance. “Amazing team effort,” Rinne said, and he was asked about the save he managed with the knob of his stick. But still, even if it’s lucky, you have to acknowledge that there’s some level of almost-inhuman awareness and reflexes in that save. It’s a save that only a fully focused goalkeeper can make, and that’s what Pekka Rinne was able to bounce back and be on Thursday night. For a team used to scoring very pretty goals, this was a tough, ugly win for the Predators. They came out on top in Game 4 not through breakout rushes and Filip Forsberg dekes, but by staying disciplined and exploiting the small cracks in Connor Hellebuyck and the Jets defense. Ryan Hartman’s first goal was unassisted off a scramble in front of net, and PK Subban’s winner was simply a blast through traffic. This was the least offense the Predators have had in a win all postseason, and yet that was what they needed to hand Winnipeg its first loss on home ice since February. They go back to Nashville for Game 5 on Saturday, and suddenly, after sitting on the brink of a disastrous series deficit, the Preds’ mistake-free hockey seems to have given them the upper hand.